Dr.Malpani's Blog: Why do patients select bad IVF clinics? Patients spend a lot of time, money and energy in selecting an IVF clinic for their treatment, because they know that a lot depends on this decision. While they cannot possibly influence the outcome of the IVF treatment cycle , choosing the right clinic maximizes their chances of having a baby, because a good clinic has high success rates , and follows the right processes. However, many patients still continue going to poor quality IVF clinics, even though there are many good IVF clinics today. Why do they select so poorly ? I think the reason for this is because they don't bother to do their homework . They do not try to find out what the characteristics of a good IVF clinic are ; and they are clueless about the deliverables which a good clinic provides. The perfect deliverable would be a baby, but the harsh truth is that IVF cycles do fail, no matter how good the clinic is. Patients need to invest in learning more about IVF, so that they become sophisticated enough to differentiate between a good clinic and a bad clinic. Lots of patients say - I am just a patient , so how can I do so ? Shouldn't the fact that I am going to an IVF specialist be enough ? After all , isn't it the doctor's job to provide me with the right medical care? How can I possibly learn to differentiate between a good doctor and a bad doctor - I am not an expert ! This is extremely naive. Patients cannot afford to be passive, and they cannot expect doctors to regulate themselves . 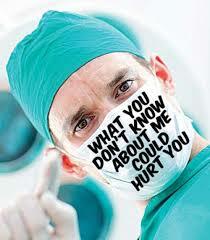 Sadly, the medical profession tolerates bad doctors because they are colleagues and peers. All IVF doctors know there are bad IVF clinics which indulge in malpractices , but no doctor is ever going to speak up in public about these because they don't want to bad mouth each other. Criticising another doctor is seen to be politically incorrect, which is why most doctors keep quiet, even though they know that the IVF clinic is cheating patients and taking them for a ride. They will complain in private, but do not have the courage to do so in public. This professional conspiracy of silence is one of the reasons why bad IVF clinics continue to flourish. They take advantage of the patients' ignorance - and it can be very easy for a doctor to fool the patient. While clinics are to blame, I think patients are to blame even more. After all, you can't change some else's behavior ! Because there is a financial incentive for clinics to offer poor quality services, they will continue to do so, because this increases their profit margins. There really is no excuse for patients not being willing to do their own homework, especially in this day and age , when so much information is so freely available online. The good news is that the key question the patient needs to ask is very simple - Does the IVF clinic provide embryo photos routinely for all patients before the transfer? If it does not, this is a red flag, and you should look for a better alternative.